Who can remember the line from the nursery rhyme little girls are made of sugar and spice and everything nice? Being nice is something that takes practice and effort for some people but for me I find that being nice just makes my day better. I greet strangers when walking the dogs, I say thank you to cashiers when I pay for something and I try and let people know when they have done something that makes my heart smile! Sadly, I cannot say that everyone I know has this same attitude. Being nice means replying to invitations when they are sent; arriving for dates you have made; sending ‘bread and butter’ thank you messages. Or taking the time out to ask a friend how she is. It means listening to people when they need to talk, or just being there for someone ‘in case’. I have a group of friends who are sugar and spice and everything nice. One friend kept another company at a dinner party I hosted. A couple opened their home to us so we had a bed for the night when we could not drive home after having one glass (or maybe one bottle) too many to drink. I have a friends who mean the world to me and I hope that each time I am with them their hearts smile! Cinnamon sugar is the spice that is everything nice – warming and sweet and great for pancakes. I used to make pancakes a lot when the boys were little, with the most impressive part of the baking being when I flipped the pancakes over. Each person has their favourite topping and both Dave and I love cinnamon sugar with a squeeze of lemon. I always have a flavoured sugar in a jar and here is a recipe that is easy to make and even easier to store. Use it in place of regular sugar for your baking and you will taste the lovely spice note of the cinnamon. Here I have used it to flavour the crumble. Cinnamon sugar is one of favourite things! Great mix to have prepared in the cupboard. I cannot imagine how expensive this is to buy! 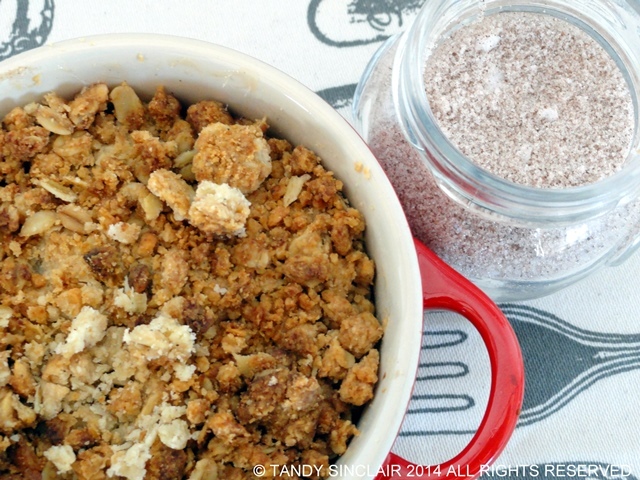 Great and simple mix of sugar and cinnamon that can be very handy…thanks Tandy! What a great idea. I love the idea of putting cinnamon into recipes not only for it’s flavor but also because I’ve read that it’s supposed to help regulate blood sugar. I know that saying, too. It reminds me of childhood :). I love cinnamon sugar! So, thanks for sharing, Tandy! What a lovely post, Tandy.